What is a significant leg length discrepancy? The body grows on two sides and leg length discrepancies are common but often asymptomatic. Leg lengths can vary up to a centimetre and people can be completely unaware of any difference. In my experience once a leg length is over a centimetre most people become aware with time. Differences between 1-1.5centimetres are marginal but over that difference most people will develop symptoms and over two centimetres they definitely will. What symptoms does a leg length discrepancy cause? Back Pain - lower back pain that gets worse with activity and is of gradual onset is the most common symptom caused by a leg length discrepancy and a common story is a patient attending a chiropractor or physiotherapist for back pain and that clinician diagnosing their leg length discrepancy. Sometimes the patient has been unaware of the presence of the discrepancy until that point. The cause of the back pain is persistent pelvic tilting which causes a postural scoliosis. scoliosis means bending of the spine and postural means a flexible scoliosis that can correct if the leg length discrepancy is corrected. Scoliosis can sometimes be fixed and be caused by an intrinsic problem with the spine and sometimes this can present as a leg length discrepancy when the fundamental problem is in the spinal deformity. This back pain often worsens slowly over time and ageing and correction of the leg length discrepancy can relieve the back pain. Limp - With a large leg length discrepancy over 2cm there is often an obvious limp but with differences below that the limp is often subtle. This is because the patient compensates through tilting their pelvis and this disguises the leg length discrepancy. Knee Pain - With a leg length discrepancy the long leg is often bent at the knee to functionally "shorten" the long leg. This means that the knee on the long leg has to "step up" every step and this increases the stress on the kneecap on the long leg and over time can contribute to fatigue and pain. What treatment options are there for a leg length discrepancy? The treatment options for a leg length discrepancy are Nonoperative and Operative. This involves the use of orthotics or heel raises within the shoe- this is possible if the leg length discrepancy is less than 1cm and it is convenient because it does not rely on modification of the shoe. Non operative treatment despite its limitations is still the safest way to correct a leg length discrepancy. This can be done for smaller leg length discrepancies less than 3cm. It is too dangerous to acutely shorten more than 3cm because you can have blood vessel blockage that can lead to limb threatening problems. 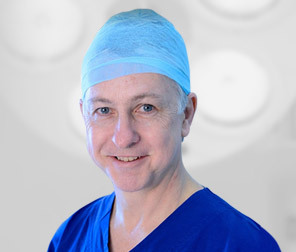 The way it is done is to remove a segment of bone- usually the femur because it is just one bone as opposed to the tibia and fibula below the knee. The segment is removed and the bone acutely shortened and then fixed- either with plating which is my preference or using an intramedullary nail. The patient is non weight bearing for the first six weeks and then partial weight bearing until 12 weeks postop. The advantage of this approach is that you correct the leg length discrepancy acutely. The disadvantage is that the patients height is reduced by the amount that is removed. This can be a major issue for some patients. There is a limit to the amount that can be shortened. The maximum is 3cm but the usual amount is 1-2cm. The bone shortening makes the muscle relatively long and "weak" and this can contribute to quadriceps weakness and anterior knee pain. This usually responds to physiotherapy but is a greater risk if the shortening is larger. This is used mainly for lengthening of the femur. It is composed of a rail that sits on the outside of the thigh parallel to the femur and gets fixation to the femur through pins into the bone and a surgical fracture called an "osteotomy" is performed. As the bone starts to heal the bones are distracted 1mm per day by adjusting the frame and new bone forms in the gap - this is called Distraction Osteogenesis. When the bone is out to length which is determined by x ray and clinical examination then the frame is locked down and the bone allowed to heal before it is removed. In general the healing time is twice as long as the distraction time so it depends on the amount of lengthening but in general most lengthenings up to 3cm will require an external fixateur time of up to six months with four months the minimum. The advantage of the monolateral external fixateur is that there is no foreign material left behind when the external fixateur is removed. The disadvantage is the presence of the fixateur on the outside of the leg creates some practical difficulties with clothing and day to day activities. It is also a point of curiosity for friends family and strangers that can become irritating in the form of repetitive questions. More importantly there can be issues with pin tract infections and scarring around the pin sites. There can be restriction of joint range of motion caused by soft tissue tethering and with larger lengthenings this can be an issue. This can be in the form of an Ilizarov type external fixateur or a Taylor Spatial Frame which is an evolved form using a computer programme to assist in planning and completion of the correction. In most situations now we would use the Taylor Spatial Frame. 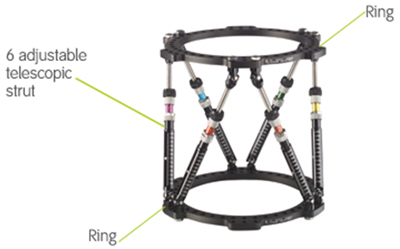 A circular external fixateur is a modular frame that is custom made to match the deformity of the patient. It is usually applied to tibial and foot and ankle deformities but can be applied to the femur humerus or forearm. Fixation to the bone is achieved through pins or tensioned wires and an osteotomy of the bone is performed with gradual adjustment of the frame to achieve lengthening similar to the monolateral external fixateur. The advantages and disadvantages of a circular external fixateur are similar to the monolateral frame however there is greater flexibility to correct other deformities other than length at the same time- this may include angulation, translation or malrotation. Currently there are three intramedullary nails that can be used for lengthening in Australia but only one has TGA approval and a rebate code with the health funds which makes it an affordable alternative. This is the ISKD Nail. 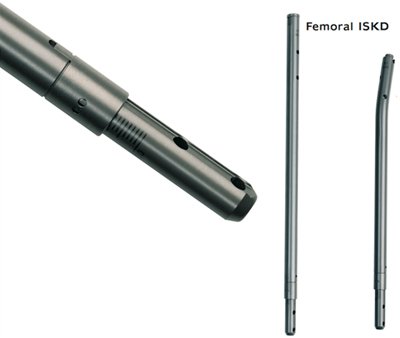 This nail lengthens through a mechanical ratcheting mechanism and can be used to lengthen the femur or the tibia. It can lengthen up to 5cm at a time and the nail is set to lengthen the pre determined amount before it is inserted. The Nail is inserted similar to a standard intramedullary nail by creating a path in the bone using intramedullary reamers and then inserting the nail across the osteotomy and fixing it proximally and distally with locking screws. With normal movement and mobilisation touch down weight bearing with crutches there are small rotational movements that occur at the osteotomy site and this causes lengthening of the nail. When the nail reaches the limit of its predetermined lengthening it locks out and the patient gradually increases their weight bearing as the bone healing progresses. The rate of healing is similar to the external fixateur but the transition from post surgery to normal function is smoother. There is usually less pain than with an external fixateur but this does not mean that there is NO pain. There is better preservation of joint range of motion of the joint above and below the site of lengthening. When the nail is inserted and during the lengthening phase the patient needs to be seen every week with clinical examination and xray- this is to check the rate of lengthening and recognise any problems that may be developing early so they can be corrected. Once the nail is out to length and has stopped lengthening then the patient is reviewed on a monthly basis with supervised increase in activity as healing progresses. In most circumstances, given the choice patients prefer the ISKD nail to the external fixateur. It is important to understand that the nail only lengthens- it does not correct other deformities such as angulation translation or rotation unless those deformities can be corrected acutely at the time of nail insertion. This sometimes is possible but depends on the circumstances. In general if there are other deformities other than length that need to be corrected then one needs to use a Taylor Spatial Frame or equivalent. When a patient presents with a leg length discrepancy and after careful history, clinical examination and xray examination I will define the problems and propose a treatment plan. When possible the patients preference will be a paramount factor in deciding the treatment plan but not all options are always available depending on multiple factors and it is my role with knowledge and experience to guide the patient through that decision process. This is done through a detailed letter to the GP which I copy to the patient and through detailed discussions in the consultation room.